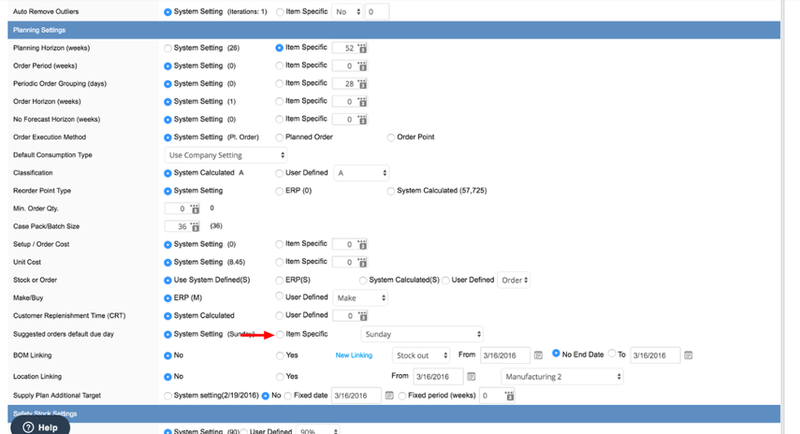 When running requirement planning in weekly buckets, the default planning due day for planned suggested orders are defined in the Requirement Plan and Ordering Systems Settings. Changing the day for a specific item is handle in the items options tab or via multi-edit. Under Planning Settings, click on Item Specific radio button for "Suggested order default due day" and choose the day for the order to arrive. Scroll down and click save to apply the new planning day. Scroll down to Planning Settings and click on the radio button for "Suggested order default due day" to enable the setting change. Click on Item Specific radio button and choose the day for the order to arrive. Click save to apply the new planning day.